Part of the popular Big Ideas series, The Science Book explores the history of science, how scientists have sought to explain our incredible universe and how amazing scientific discoveries have been made. Discover how Galileo worked out his scientific theories of motion and inertia, why Copernicus's ideas were contentious and what the discovery of DNA meant. 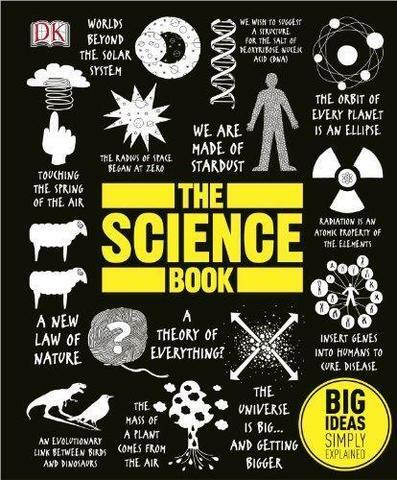 All the big scientific ideas and discoveries are brought to life with quirky graphics, pithy quotes and step-by-step 'mind maps', plus every area of science is covered, including astronomy, biology, chemistry, geology, maths and physics. You'll be brought up-to-date on scientific ideas from black holes to genetic engineering with eye-catching artworks showing how the ideas of key scientists have impacted our understanding of the world. Whether you are a science student or just have an interest in scientific ideas, The Science Book is a perfect way to explore this fascinating subject.